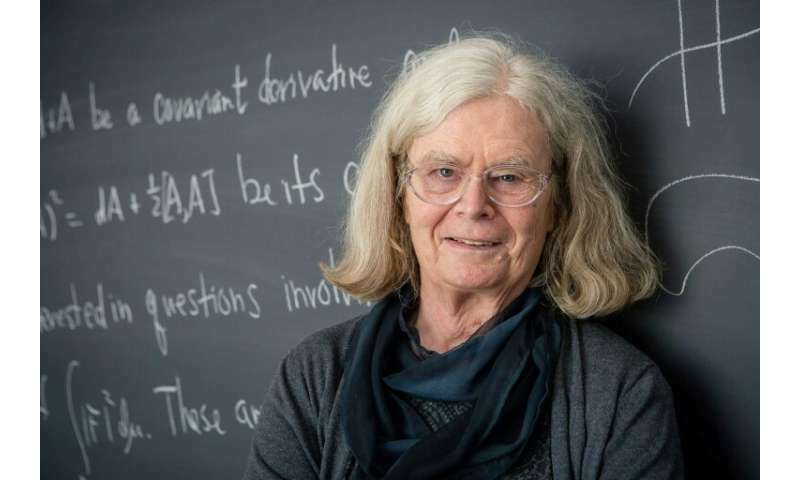 Women took another step forward in the still male-dominated world of science Tuesday, as American Karen Uhlenbeck won the Abel Prize in mathematics for her work on partial differential equations. "Karen Uhlenbeck receives the Abel Prize 2019 for her fundamental work in geometric analysis and gauge theory, which has dramatically changed the mathematical landscape," Abel Committee chairman Hans Munthe-Kaas said in a statement. "Her theories have revolutionised our understanding of minimal surfaces, such as those formed by soap bubbles, and more general minimization problems in higher dimensions." She is the first woman to win the prize, which comes with a cheque for six million kroner (620,000 euros, $703,000). She is also an advocate for gender equality in science and mathematics. "I am aware of the fact that I am a role model for young women in mathematics," said Uhlenbeck, according to a Princeton statement. "It's hard to be a role model, however, because what you really need to do is show students how imperfect people can be and still succeed... I may be a wonderful mathematician and famous because of it, but I'm also very human." Uhlenbeck, 76, is a visiting senior research scholar at Princeton University, as well as visiting associate at the Institute for Advanced Study (IAS), both in the US. The Cleveland native "developed tools and methods in global analysis, which are now in the toolbox of every geometer and analyst," the Norwegian Academy of Science and Letters said. With the award, Uhlenbeck joined a still very small club of women who have scored a scientific prize. Of the 607 Nobel prizes in physics, chemistry or medicine between 1901 and 2018, only 19 women were among the awardees, according to the Nobel Prize website. Marie Curie won twice, once for physics and another time for chemistry. Only one woman has won the other major international mathematics prize—the Fields Medal—Maryam Mirzakhani of Iran in 2014. She died in 2017. Princeton mathematician Alice Chang Sun-Yung, who is a member of the Abel committee, said "women are relative 'newcomers" as research mathematicians, so it will take a while for us to get to the level of the 'top prize winners.'" "There needs to be some 'critical mass,' not a just few truly outstanding exceptional individuals for the math community to recognize and accept women as equally talented (in math) as men," she told AFP. "But change is coming and is in the air," she added, pointing to wins by Uhlenbeck and Claire Voisin, who won the Shaw Prize in science in 2017. Named after the 19th century Norwegian mathematician Niels Henrik Abel, the prize was established by the Oslo government in 2002 and first awarded a year later, to honour outstanding scientific work in the field of mathematics, a discipline not included among the Nobel awards. Along with the Fields Medal, which is awarded every four years at the Congress of the International Mathematical Union (IMU), it is one of the world's most prestigious maths prizes.